Language Log » Neoguri: raccoon or raccoon dog? Neoguri: raccoon or raccoon dog? The typhoon that struck Okinawa a few days ago and is now passing by Tokyo is called Neoguri. It gets it name from a Korean word meaning "raccoon dog". The Japanese refer to it as Taifū 8-gō Neoguri 台風８号ネオグ リ ("Typhoon No. 8 Neoguri"), but most often without the "Neoguri" (see below for discussion of Japanese typhoon designation practices). However, the Chinese are calling it Huànxióng 浣熊 ("raccoon"), which is a clear mistranslation. The Chinese name for the raccoon dog is hé 貉 or háozi 貉子. Bathrobe, who called Neoguri to my attention, writes: "Chinese has got itself in knots over naming precisely because of Chinese characters." The crux of the matter lies in the fact that, for Chinese, lí 狸 means ("raccoon"), while for Japanese it is the celebrated tanuki 狸 ("raccoon dog"), about which we will have much to say in this post. While the tanuki is ubiquitous in Japanese folklore, legend, and art, Language Log readers outside of Japan may be familiar with this endearing creature mainly through the 1994 Japanese animated fantasy film produced by Hayao Miyazaki entitled Heisei Tanuki Gassen Ponpoko 平成狸合戦ぽんぽこ ("Heisei-era Raccoon Dog War Ponpoko"). The Chinese are digging in their heels on this, with the head of the Central Weather Bureau Forecast Center (Zhōngyāng qìxiàng jú yùbào zhōngxīn 中央氣象局預報中心) insisting that Huànxióng 浣熊 ("raccoon") is the correct translation of Neoguri. I would urge the Chinese authorities to read this article (published in 2008 [!] when another typhoon with the same name struck East Asia [there have actually been three cyclones with this name, all mistranslated in Chinese]) by my friend, the Hong Kong scholar Yao Dehuai, head of the Hong Kong Chinese Language Society, in which he demonstrates conclusively that Neoguri should be translated as hé 貉 or háozi 貉子 ("raccoon dog"), not huànxióng 浣熊 ("raccoon". See also "The origin of the name" in this article on the China dictionary website. Xiànzài cháng tīng rén shuō, Hànyǔ yīng kě chéngwéi guójì yǔyán. Dànshì Hànyǔ miáoshù xiànjīn shìjiè, kùnnán chóngchóng, chángcháng chūcuò, qiě nào xiàohuà, yòu bùnéng róngnà qítā yǔyán. Shìwèn: Hànyǔ rúhé kěyǐ chéngwéi guójì yǔyán? 現在常聽人說, 漢語應可成為國際語言。但是漢語描述現今世界, 困難重重, 常常出錯, 且鬧笑話, 又不能容納其他語言。試問：漢語如何可以成為國際語言? "Nowadays we often hear people say that Sinitic / Chinese should be able to become an international language, but there are innumerable difficulties in describing the modern world with Chinese, and mistakes are frequent and laughable. Moreover, Chinese cannot accommodate other languages. Allow me to ask: how can Chinese become an international language?" Incidentally, Yao was formerly a professor of mathematics at The University of Hong Kong, which may account for his perspicuity. Back to the question of the relationship between the raccoon and the raccoon dog (not to be confused with the coonhound or the dachshund ("badger dog"). The raccoon dog bears an amazing resemblance to the raccoon, and in some respects even acts like a raccoon (e.g., it climbs trees), but it is actually a kind of dog and belongs to the biological family of dogs, Canidae. Thus it is more closely related to foxes (also belonging to Canidae), at least one species of which, the gray fox, climbs trees (see here, the second paragraph) The raccoon, on the other hand, belongs to the family called Procyonidae. While the markings on the face of the raccoon dog (Nyctereutes procyonoides) are uncannily similar to those of a raccoon (Procyon lotor), the raccoon dog lacks the distinctive banded tail and semi-prehensile front paws of the raccoon. Here are images of the raccoon dog and the raccoon. You can see the similarities and differences for yourself. bright star in constellation Canis Minoris, 1650s, from Latin, from Greek prokyon, from pro "before" (see pro-) + kyon "dog" (see canine (n.)); so called from its rising just before the "Dog Star," Sirius. By Roman astronomers, sometimes Latinized as Antecanis. By the way, for fans of the Online Etymology Dictionary in East Asia, there is now a brand-new, official app for China, Taiwan, Hong Kong, and Macao. In Japanese, the raccoon dog is called tanuki, a mysterious, lovable creature that is the source of an enormous amount of folklore and folk art. Its representation can be found in front of Japanese restaurants and other establishments, usually with grossly exaggerated scrotum. At this point, I would like to introduce an extraordinary site on Japanese Buddhism (esp. statuary) and folklore. This page is about the TANUKI, but see along the left side for many other subjects. The author, Mark Schumacher, holds a graduate degree in Japanese Studies from SAIS (Johns Hopkins). Although the site is primarily about the Japanese subjects I mentioned at the beginning of this paragraph, it also includes a vast amount of information about related Chinese subjects. Returning to the basic terms of this discussion, in Chinese we have hé 貉 ("badger; raccoon dog"; in Japanese this character would be pronounced mujina ["badger; raccoon dog"]) and háo 貉子 ("raccoon dog"; this term doesn't exist in Japanese). Never mind that 貉 is pronounced mò when it means 貊 ("leopard"; name of a tribe in northeastern China). So far as I know, the most common term for "raccoon" in MSM is huànxióng 浣熊 (lit., "washing bear"), which I remember learning and using more than forty years ago. The fact that the most common word in Chinese for raccoon literally means "washing bear" struck me as odd at the time I first learned it, but now that I am revisiting the word and thinking about it intensively, I am prompted to look at the etymology of the English word "raccoon" and related words for this adorably quirky animal in other languages. The word "raccoon" was adopted into English from the native Powhatan term, as used in the Virginia Colony. It was recorded on Captain John Smith's list of Powhatan words as aroughcun, and on that of William Strachey as arathkone. It has also been identified as a Proto-Algonquian root *ahrah-koon-em, meaning "[the] one who rubs, scrubs and scratches with its hands". Similarly, Spanish colonists adopted the Spanish word mapache from the Nahuatl mapachitli of the Aztecs, meaning "[the] one who takes everything in its hands". In many languages, the raccoon is named for its characteristic dousing behavior in conjunction with that language's term for bear, for example Waschbär in German, orsetto lavatore in Italian, mosómedve in Hungarian and araiguma (アライグマ) in Japanese. In French and Portuguese (in Portugal), the washing behavior is combined with these languages' term for rat, yielding, respectively, raton laveur and ratão-lavadeiro. Note especially that, aside from the transliteration in katakana of the English word, rakūn ラクーン, the raccoon is also called araiguma アライグマ (the Ministry of the Environment does not use characters for the animal, only katakana; if written in kanji, it would be 洗い熊), which means precisely "washing bear". Curiously, this coincides exactly with the most common name in MSM for the animal, viz., huànxióng 浣熊, which could be added to the Wikipedia article quoted just above. In a personal note and also on his site, Mark Schumacher mentions that the tanuki 狸 (var. 貍) is conflated with the mujina 貉 ("badger"). In fact, he says, it is the mujina that comes first to Japan. The mujina are mentioned only twice in the Nihon Shoki 日本書紀 (Japan's oldest text ). For reasons unknown, the mujina disappear from Japanese literature after the 8th century and do not reappear until the 18th century, when they are conflated with (by then) popular tanuki 狸.
Nathan Hopson observes that 狸 is a wonderfully descriptive kanji, in that the tanuki was perhaps the most familiar beast (⺨) seen in and around settlements (里). That may be an overstatement, but the tanuki was a frequent nocturnal visitor in many rural areas — and even urban ones, if I understand correctly — until quite recently. While we are wrestling with the linguistic terminology and biological classification of raccoons (Procyonidae) and raccoon dogs (Canidae), we might as well take care of pandas, both because they are also attractive to humans, but also because their zoological classification has long been in doubt. The Chinese call the giant panda dà xióngmāo 大熊貓 ("big bear cat") and the red panda xiǎo xióngmāo 小熊貓 ("little bear cat"), but neither of them are cats (Felidae). …for a long time people have disagreed about whether ginat pandas and red pandas were bears or raccoons. Until some new technology came along, they mostly had to look at bones and teeth. Scientists have used DNA to find out that the giant panda is more closely related to the other bears than to the raccoons. Giant pandas are in the family Ursidae with the seven other bear species. Raccoons are in the family Procyonidae, along with ring-tails and coatis. The bear family and raccoon family are closely related. Red pandas (often called lesser pandas) are now put in the raccoon family. Now that we've got our animals straightened out, how about our typhoons? In general, the Japanese eschew the international naming system and stick to numbers. Numerical naming is probably not a bad idea given that female-named hurricanes cause more damage because people don't take them seriously. No, seriously. My only observation is that the naming of storms is ridiculous. Calling them by their number makes so much more sense. The only reason the Japanese have added ネオグ リ is that the Western-language media insist on calling storms by name. For those who are interested in how the names of typhoons in Asia are determined, there is a thorough explanation here. Out of 140 names, twenty are Korean (10 from North Korea and 10 from South Korea). Korean names include those that mean ant, lily, rose, and swallow (South Korea), rainbow, echo, pine tree, sunset (North Korea), etc. The raccoon dog (neoguri) was proposed by South Korea. I had to laugh though. On US news reports the announcer pronounced Neo as you'd expect of English speakers: like the hero of the Matrix series. Not exactly an optimal romanization for speakers of English! I was going comment in a different vein entirely, but having no Korean I had to consult references and now I'm a bit confused. I looked up both raccoon dogs and raccoons on the Korean Wikipedia by navigating to the English language versions of the articles and following the Korean interwiki links. Raccoon dog is 너구리 (neoguri), but raccoon seems to be 아메리카너구리 which, if I'm not mistaken, means "American neoguri". Is it possible then, that the Chinese confusion here is due to the fact that there is no clear distinction between these animals in Korean any more than there is in English? Google Translate doesn't know the difference either. It tells me 너구리 means "raccoon" and that 아메리카너구리 means "American raccoon". @Chris C.: Of course you are right. The heart of the confusion is really the similarity of the terms 'raccoon' and 'raccoon dog'. This is unsurprising, since the raccoon is a western hemisphere species and is unknown in Asia, so it has no native name in East Asian languages and no character. What the original meaning/use of the character 狸 was is unclear to me (maybe it meant 'badger' originally), however the Japanese now use the character to mean 'tanuki, i.e., raccoon dog'. Chinese seems to use it to refer to raccoons (which makes sense, since raccoons are related to badgers), though in what way is still unclear to me. So I think VMs point is that this is a case where the use of characters, rather than helping understanding, really just causes confusion. Thank you, Victor Mair, for this fascinating post!! I always wondered what a 貉 was and, as with numerous Chinese characters for animals, I never looked it up in a Chinese dictionary because I didn't know the pronunciation (and so couldn't look it up easily by romanization), and it is so troublesome to look it up by number of strokes. "aroughcun" (Powhatan), "arathkone" and "*ahrah-koon-em" (Proto-Algonquian). Does anyone know the meaning of "-cun", "-kone", or "-koon" in these words? Also, regarding naming hurricanes, I do like giving them names rather than numbers, just as I much prefer names for streets, buildings, trains, people etc., rather than numbers. Is this a qualitatively different phenomenon from how, e.g., the English noun "buffalo" is used to refer to different (but in some loose sense similar) species in different parts of the world, such that one could argue that the default BrEng meaning is different from the default AmEng meaning? FWIW, the animal known as a "bearcat" in English is neither a type of cat nor a type of bear, but is most closely related, zoologically speaking, to the civets. Japanese sources writing "neoguri" as a tetrasyllable (ネオグリ) would seem to have adapted it from English-language sources, without knowledge of Revised Romanization of Korean. The Korean word is trisyllabic and would be better transcribed in katakana as "noguri" (ノグリ). I knew I'd seen the word somewhere else. 'Neoguri' is the name of a popular brand of Korean ramyeon (noodles) (http://www.nongshimusa.com/our-products/meal-noodle/neoguri). I don't know the source of the name. 너구리 neoguri is pronounced /nʌɡuɾi/ in Korean. The Revised Romanization of Korean (RR) writes the vowel /ʌ/ as 'eo'; this also appears in 서울 Seoul /sʰʌul/, although the spelling Seoul predates RR and probably comes from French Séoul (with the syllabic division 'Sé-oul'). English speakers should note that this vowel in Korean is a half-rounded [ʌ̜] rather different from the English STRUT vowel which is conventionally written /ʌ/, but may be closer in value to the LOT vowel /ɒ/ for British English speakers or the THOUGHT vowel /ɔː/ for American English speakers. Korean doesn't have lexical stress, but for English speakers, putting a stress on the initial syllable will sound closest to Korean. Korean Wikipedia calls the raccoon 아메리카너구리 amerika neoguri "American raccoon dog", although from my childhood animal picture books I'm more familiar with 미국너구리 miguk neoguri, where 미국 miguk refers specifically to the U.S. while 아메리카 amerika often refers to the Americas as a whole. 아메리카너구리 amerika neoguri is probably more appropriate, though it's more of a mouthful for Koreans. The raccoon is a New World animal, so it's not surprising that English uses a term derived from Powhatan while Korean calls it the American version of the familiar raccoon dog. But the raccoon dog, which is indigenous to East Asia, was apparently not known to English speakers before the word raccoon had already entered the English language. Interestingly, Korean Wikipedia says that the North Korean name for the raccoon is 개곰 gaegom (or kaegom in McCune-Reischauer, as it is North Korean), literally "dog-bear", which is confirmed by 조선말대사전 Chosŏnmal Taesajŏn, the standard dictionary for Korean as used in North Korea. @David Morris: Apparently, Neoguri instant noodles were so named because they were inspired by the Japanese Tanuki udon, which might be a play on Sanuki udon (讃岐うどん). As mentioned in the post, 狸 tanuki is "raccoon dog" in Japanese. In my earlier comment, I gave the literal translation of 개곰 kaegom, the North Korean name for the raccoon, as "dog-bear" (개 kae "dog" + 곰 kom "bear"; I'm using McCune-Reischauer romanization throughout this comment as it pertains to North Korean usage). It occurs to me that 개 kae is also an unrelated prefix applied to things that are considered rough, poor imitations of the original, especially for plants and animals. Thus 개나리 kaenari "forsythia", a common flower in Korea, is considered a poor man's 나리 nari "tiger lily"; 개살구 kaesalgu "Manchurian apricot", which is less tasty than the commonly eaten 살구 salgu "Siberian apricot", is often used metaphorically for something ugly or unpleasant. So it is conceivable that 개곰 kaegom is an instance of this prefix in use, describing the raccoon as a rough, lesser imitation of the bear. The problem is that I doubt that the prefix has been very productive in recent times, and Koreans can't have been aware of the raccoon for much more than a century or so. Unfortunately, the North Korean dictionary doesn't provide any etymological information. "but the tanuki was a frequent nocturnal visitor in many rural areas — and even urban ones, if I understand correctly — until quite recently." (sometimes with a companion) used to cut through our garden at dusk (in 2012; haven't seen it more recently, though). This is Shinanomachi (near Yotsuya), which is dead downtown Tokyo, smack dab in the middle of the Yamanote loop line. My parents had raccoon troubles on Beacon Hill, which is also dead downtown. These beasts do just fine in urban environments, it seems. It's very close to the Korean pronunciation of 너구리 neoguri—even the tapped R, which is probably overkill. As a KSL learner, I think of 어 as (closer to) /ɒ/. I get very annoyed when people transliterate it as 'u', because I associate that with 우. At one time I applied for a job at 'Kyungpook National University' and it took me a very long time to realise that it was the same word as is usually spelled (and I would always spell) 'Gyeongbuk'. My wife informs me that the cartoon animal on the Neoguri ramyeon webpage (though not, as far as I can see, on the package itself) is the animal neoguri. Thank you very much for the great photograph and for the confirmation of urban tanuki in the heart of Tokyo and urban raccoons in the center of Boston. I don't blame you for being confused about the difference between words for raccoon and raccoon dog in Korean. A Korean language teacher (who speaks good English and is respected in his field) just told me without hesitation that the neoguri is a raccoon! Astute observation about the syllabicity of neoguri! Your sensible remarks about the regional distribution of raccoons and raccoon dogs are much appreciated, as is what you say about character usage, but badgers (in family Mustelidae, together with weasels, otters, and martens) and raccoons are not related, except that they are both carnivorous mammals. Your honesty confirms what many others are unwilling to recognize publicly: Chinese characters are very hard to look up in dictionaries, encyclopedias, indices, etc., also to input in computers and other electronic devices — unless one does so by sound. Excellent observation about "buffalo"! And you are right about the "bearcat" being neither "bear" nor "cat", since it belongs to the family Viverridae, along with civets and genets. The "bearcat" is also known as the binturong (Arctictis binturong). Since the binturong is native to Southeast Asia, even the scientific genus designation as "Arctictis" is somewhat misleading, inasmuch as it comes from New Latin (arct- + Greek iktis yellow-breasted marten). Now, what does this arct- mean besides "bear"?! arct- or arcto- [Greek arktos bear (the animal); the sense, north, is through the northern constellation, the Great Bear] (1) bear (Arctodus); (2) north, northern (arctic). Glad you mentioned the noodles! Thanks for your, as always, learned and informative comments. We are very fortunate to have you as a regular reader at Language Log. @David Morris: My wife informs me that the cartoon animal on the Neoguri ramyeon webpage (though not, as far as I can see, on the package itself) is the animal neoguri. But the cartoon animal has a striped tail, which would make it a raccoon, not a raccoon dog if we insist on correct anatomical details! It must be said that Korean speakers rarely distinguish raccoons from raccoon dogs, using 너구리 neoguri to name both. Korean speakers in the U.S. only ever call raccoons 너구리 neoguri, never 아메리카너구리 amerika neoguri or 미국너구리 miguk neoguri which would be zoologically more correct. Most are probably not even aware that raccoons in the New World are quite different animals from the raccoon dogs back in Korea. It's yet another example of a single common name being applied to similar-looking animals without taxonomic justification, like "polecat" being used for various medium-sized mammals, even skunks. Just to keep the actual relationships straight, one can find Nyctereutes procyonoides down at the bottom of the taxonomic tree for the Subfamily Caninae of the Family Canidae. At the basal level, it's hard to figure out which common animal names fit a given species properly. Regarding the name of this creature in English. I've never called it a "raccoon dog" or heard anyone call it that name. To me it's always been a "tanuki." My experience is that if you know about this creature at all, you have some familiarity with Japanese folklore and you use the Japanese word. Thanks for your sympathy understanding about the difficulty of looking up a Chinese character in dictionaries, encyclopedias, indexes, etc., unless one knows its sound (and romanization) and moreover can find the relevant dictionaries, encyclopedias, indexes, etc. arranged alphabetically. Two great works that desperately need alphabetization are the index to James Legge's multi-volume "The Chinese Classics" and Soothill's "'Dictionary of Buddhist Terms". Because of this difficulty, there are numerous characters, not only for animals but for plants, flowers, chemical elements, musical instruments, and all sorts of things, that I haven't looked up, but only have a rough idea of what they mean, from looking at the radical (plant radical, insect radical, chemical [metal] radical, and so on). And I simply take the sound-element of a word for its sound. For instance for 狸 ("raccoon"), I'll pronounce it 里 li (which turns out to be correct) and for 貉 he "badger", I'll pronounce it 各 ge （which turns out to be wrong), and, from the context, guess that these are some sort of four-footed animals. I think that's what most educated Chinese people do. We learn to live with uncertainty and vagueness as to the meanings of characters whose sounds we don't know. (Leibniz, curiously, said that "The Chinese language has a wonderful script– symbols without sounds.") It's too much trouble looking up the dictionary without knowing the sound (and therefore romanization). Of course, this aversion to looking up characters in the Chinese (non-romanized) dictionary takes away a great deal from the enjoyment of a novel like Hou Lou Meng (Dream of the Red Chamber) , sometimes called the greatest novel of the world, because it talks so much about plants and flowers, foods, articles of clothing, medicines, and all sorts of other things, written in characters whose sounds we–I– don't know. As for the storm, when the Korean media reported its name, I thought they simply translated the English term raccoon. In fact, it is common that the species of North American raccoon is translated in Korean as bukmi-san (pro. book-mi-san) 北美産 neoguri, meaning North-American raccoon. Butcher Pete wrote, "My experience is that if you know about this creature at all, you have some familiarity with Japanese folklore and you use the Japanese word." Another possibility is that you live in Sweden or Finland, and are aware of the animal as an obnoxious invasive species to be tightly controlled. One major concern is that they are infested with parasites like nematodes, ticks and fleas, and the feared Echinococcus tapeworm. They are also harmful to game bird populations. The Swedish name is a composite, like others mentioned: mårdhund is literally "marten dog". What?? Not even a picture?? I provided links for the raccoon dog and for the tanuki on Google Images, where you will find oodles of pictures of each. Re: Canidae climbing trees (a bit off topic, I suppose). My wife once saw a coyote climbing a tree in pursuit of one of our cats. Granted, the tree was a redwood with branches very close to the ground, but it's not behavior I'd ever heard of. My wife frightened the coyote away and all was well. We now keep our cats indoors. One of the causes of the typhoon naming blunder is lack of familiarity. Urban dwellers world wide tend not to be very well acquainted with natural flora or fauna, but the level of familiarity of the average Chinese (city or country dwelling) with types of birds and animals seems to be unusually abysmal. The 貉 or 貉子 is almost completely unknown to the average Chinese, including, it seems, the meteorological authorities, who have lost face and are trying to bluster their way out of it. What is possibly worse is that the average Chinese doesn't even seem to be terribly interested in any animal or bird that can't be eaten or put in a cage. Modern spoken (as opposed to academic or scientific) Chinese has a fairly depauperate vocabulary when it comes to bird and animal names, which stands in contrast with the very rich array of names in earlier times. I have no knowledge of Korean general familiarity with neoguri, but I do know that the tanuki is familiar to all Japanese. However, rather than being a result of contact with nature, this familiarity comes through the medium of folklore and popular culture, which still manifests itself in statues outside restaurants, modern movies, and names of foods (e.g., tanuki udon). This imbalance in familiarity is one factor making the Chinese blunder over neoguri so striking. Indeed, it is only through popular cultural channels (e.g., Japanese movies) that some segments of the Chinese population have become familiar with raccoon dogs — often without the foggiest notion that the Japanese 狸 is, in fact, their very own 貉子. So your Korean teacher is not alone. "The level of familiarity of the average Chinese (city or country dwelling) with types of birds and animals seems to be unusually abysmal." Bathrobe, you're probably right. It's the effect of urbanization. I'd never seen a raccoon until I came to the U.S.
A similar example, filing here since I just overheard a Chinese debate about the apricot pit: almond is in Chinese xìngrén 杏仁, lit. '(sweet) apricot kernel', by analogy — the flavors (among other things) are apparently similar. Distinguishing between these two in Chinese would thus require some special exertion. Incidentally, walnut is hétao 核桃, lit. 'pit peach'; here I'm unsure about the origin of the analogy (is there a variety of peach seed which is regularly eaten, does it resemble a walnut in some respect, etc.) as well as about the reason for the distinctly un-Chinese noun-modifier order: a foreign calque, or…? Maybe the point is that a walnut looks sort of like a peach pit–and comes from a fruit that resembles a green peach–but the seed inside is much bigger, and is what you're really after. And then there's xìngrén dòufu 杏仁豆腐 (lit., "apricot kernel bean curd"), which used to confuse me mightily, since neither is it made from apricot kernels nor is it bean curd. Rather, it is "almond junket". I used to be very good at making this dessert, but haven't done so for about ten years. The etymology of raccoon is unknown. The spellings of the Virginia Algonquian word include aroughcun, rarowcun, etc., etc. (John Smith) and arathkone and arrathcune (Wm. Strachey). There is no easy way to connect this to Unami Delaware (the Phila. area language) náhënëm (ë = schwa). Someone has evidently tried to do this (knowing that PA *hk > Del /h/) and has come up with a very bad and in fact completely incomprehensible PA reconstruction (“*ahrah-koon-em”) that appears online as if it were a real word an appalling number of times. I have no idea what the morphemes are supposed to be (except perhaps for the irrelevant -ëm). Can anyone trace this to the source that originally proposed it? The article on Bathrobe's site just linked to by Victor Mair covers the Mongolian names pretty thoroughly. The basically word is elbengkü элбэнх and, although one Mongolian news site does use that word to explain Korean neoguri, other (Cyrillic) Mongolian sources mostly transliterate the Korean name as Неогури Neoguri. One praiseworthy author transcribes Ногури Noguri. That o is basically /ɔ/ which is not that far from the Korean. It would be interesting to see what name is being used by Mongolian-language sources in China. One of the words for 'typhoon' in the Mongolian news is хуй салхи, which Slavic speakers will no doubt find quite apt. That would be qui salki in the traditional script; one Mongolian-Chinese dictionary translates this as xuànfēng 旋風 'whirlwind, tornado'. Adding to my previous comment, elbihe (Manchu for 'raccoon dog' and the late Jerry Norman's Manchu name) is apparently a loanword from Mongolian elbengkü. Manchu Dorgon 'Badger' is one word you would expect Qing scholars to be clear about as it was the name of a son of Nurhaci and early Qing regent. Wikipedia also gives gaegom (개곰), ‘dog-bear’, as a literary name. Wikipedia labels that name as mun­hwa­eo. A literal translation may be “cultured language”, but as far as I understand it simply means “standard North Korean”, and does not mean that gaegom is a literary name. The Korean is mistranscribed. 미국너구리 is “migugneoguli” not “migungneoguri”. migugneoguli: According to the same standard's provisions for transliteration. Later adopted by Google Translate, I think. migugneoguri (as it now appears in the main text): No system I know of, but unambiguous. As a caveat to the above, KMOCT 2000 is vague on spaces and capitalization – even the official documents published to popularize it had Hunminjeongeum in one place and Hunmin jeongeum in another. So some people will write migungneoguri and others miguk neoguri, complicating searches similarly to the way differences in Hangeul spacing usage do, but with the added change of letters at the break. If you want guidance, you can look at prescriptivist authoritative examples romanization database > example: 훈민정음"\ lang="ko">here, but I think that database includes only names, not whole sentences. Incidentally, according to Wikipedia, the original name used was "nogurii" (ノグリー), with the English spelling "Noguri". This was updated to the "Neoguri" spelling by the WMO Typhoon Committee sometime after 2002, apparently. I tried to post this some hours ago. When it didn't show up, I assumed it was awaiting a spam check and would later appear. But I still can't see it, so I'm trying again. The South Korean standard dictionary has an audio file. There is some variation among native speakers for the eo vowel. The same dictionary has no separate entry for (or redirect from) either amerika neoguri (the Wikipedia name; Wikipedia naming seems to adhere to established zoological practice rather than prescriptions by the National Institute of the Korean Language) or miguk neoguri, but the latter form appears in another entry. The entry on neoguri says it refers to Nyctereutes procyonoides kore­ensis; it does not mention any use of neoguri to refer to other animals. The word has possibly entered Korean via Sinitic, which would make it an oblique loan not treated as regular Sino-Korean. Like neoguri, most Korean typhoon names from either side are – at least super­ficially – “native” Korean nouns (called goyu­eo (固有語) or sun(純)­uri­mal, literally “pure our-language”), which I guess may result in part from many people's fond­ness of (for?) such words. 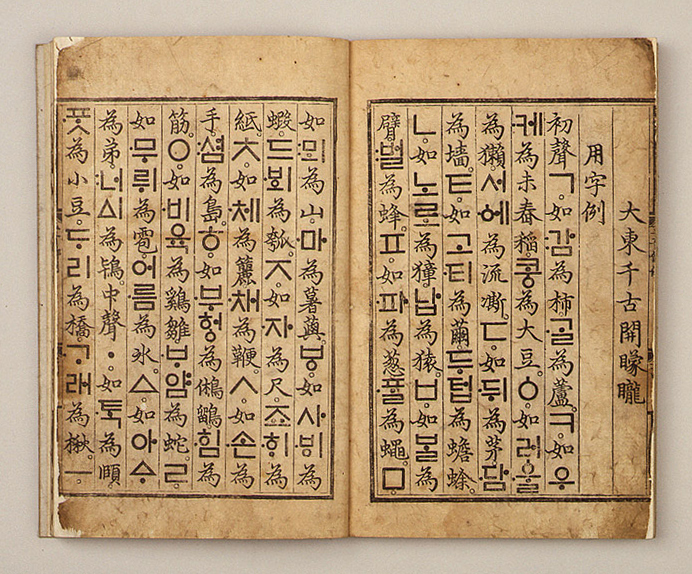 Neoguri's earliest attested Han­geul form is, in Yale tran­scription for Middle Korean, le­˙ngwul. Curiously, its earliest appearance is not in a work about animals or typhoons, but about Han­geul itself – the Hunmin­jeong­eum hae­rye­bon of 1446, where le­˙ngwul serves as a vernacular example to illustrate the use of the letter ㆁ ng. You can see the word in a sur­viving copy here: in the 4th column from the right, the pen­ultimate block is 러 = ㄹ + ㅓ, and the last one is ㆁ + ㅜ + ㄹ + a small dot on the left indicating high tone. If you don't care about ㆁ ng, skip this paragraph. The oldest documents distinguished between ㆁ, representing the velar nasal, and a letter looking like a plain circle which mostly* represented the absence of a consonant in the syllable on­set (and in some documents, even in the coda, but only in Sino-Korean syllables). Modern Korean does not have word-initial ng, and the ab­sence of a trail letter (jong­seong) is a more economic way to indicate empty syllable codas, so the distinction between the plain circle and ㆁ was soon abandoned, re­sulting in the need to write what is etymologically i (鯉) + ngeo (魚) as ing​.eo. As far as I recall from Martin's 1993 Reference Grammar, le­˙ngwul is notable for being one of very few non-Sino-Korean words that had an intial l in Middle Korean. Later forms of the word are written with an n initial (as in both the northern and the southern ortho­graphy of today), some with ㅗ wo instead of ㅜ wu, some with a final i (found in many animal names) and some with­out. There is an entry bung­neoguri (Y: puk.nekwuli; lit. “northern neoguri”) for “a neoguri that lives in the area of the Amur and Ussuri rivers in the north”, possibly referring to N. p. ussuri­ensis but with no scientific name given in the entry, unlike most entries about animals. • Middle Korean ˙mu˙ley nekwul (literally something like “aquatic neoguli”) = “otter; fur seal” – In con­temporary Korean, fur seals are mul­gae / mulq­kay, lit. “water dog”, and otters are su­dal (水獺/水㺚), which has also been used to name typhoons before it was retired in 2005. • Contemporary Korean gin­kkori neoguri / kīn kkoli nekwuli (lit. “long-tailed neoguri”) = “Potos flavus, an American Procyonid whose vernacular names include kinkajú (Spanish), jupará (Portuguese) and Wickel­bär (German)” – This name is from the standard dictionary; the Korean Wikipedia uses kinkaju. * Another function of the plain circle was this: When the plain circle immediately followed a consonant with no apparent word boundary in between (e.g. in 즛의), this probably indicated some phonetic effect – I apologize for not knowing exactly – which usually re­sulted from a lenition or elision of an under­lying plosive. I guess 즛의 would be jusGuy in the Yale tran­scription, with ㅇ G from under­lying ㄱ g.
You are right. I led Prof. Mair astray by suggesting (after an exceedingly cursory search) that Japanese used ネオグリ. I notice that Japanese sites fairly overwhelmingly equate ノグリ to なぬき (tanuki), although there are also some that equate it to アライグマ. There is at least one Japanese blog entry (たぬきorアライグマ) that questions the Chinese use of 浣熊. I'm not sure why but I can't seem to open the Raccoon blog entry at "A Thousand Miles of Moonlight" for comments. Sorry for the inconvenience. Thanks to JK for the detailed comments. I wanted to make the same comment over at A Thousand Miles of Moonlight but found it was closed for comments. 문화어 文化語 munhwaŏ is indeed the name used for the standard language in North Korea, and certainly does not mean "literary language". As JK notes, the guidelines for Revised Romanization are ambiguous on spacing. The only mention is that a space should be put between the surname and the given name, so 홍길동 is Hong Gildong. In the standard spelling rules for Korean, no space is used between the surname and the given name (hence 홍길동), but one is allowed to put a space when it is necessary to clarify the boundary, e.g. 남궁억/남궁 억 or Namgung Eok, where 남궁 Namgung is the surname. So this particular case, a space is used in the romanization where it is not used (though theoretically optional) in the Korean spelling. The standard dictionary puts no spaces (not even optional) in compound words for plants and animals. You even get relative monstrosities like 고운점박이푸른부전나비 gounjeombagi-pureunbujeonnabi "fine-spotted blue lycaenid", a butterfly species (Maculinea teleius, or Scarce Large Blue), written without spaces. There is no explanation for this in the standard spelling rules that I can find, which only says that compound words in specialist vocabulary can be written with or without spaces. So 미국너구리 miguk-neoguri would be written without spaces in Korean if it was accepted into the standard dictionary, on the model of 미국들소 miguk-deulso "American wild cattle" (bison) or 바위너구리 bawi-neoguri "rock raccoon dog" (hyrax), all written without spaces. One solution, as you see here, would be to use a hyphen in this case to separate the highest-level compound elements. The guidelines for Revised Romanization allows the use of hyphens to mark ambiguous syllable boundaries (e.g. 중앙 jung-ang) and also makes the hyphen mandatory to separate the elements representing administrative units from the names (e.g. 경기도 Gyeonggi-do, where 도 do means province). So we could think of the hyphen as a separator in Romanization which corresponds to zero space in Korean spelling. My sensibilities lean against lumping too many elements without any spaces or hyphens in Romanization, which is why I would propose using a space whenever spacing is at least optional in Korean (this would cover the space between surnames and given names, by the way), and to use a hyphen where a space would be used in McCune-Reischauer but not in the Korean spelling, e.g. preceding a particle. For example, the official set of examples for Revised Romanization gives 삼국유사 ("Memorabilia of the Three Kingdoms") as Samgungnyusa. I think it would be better to write Samguk-yusa, disregarding the phonetic assimilation that occurs in the boundary marked by the hyphen. This would also be closer to the McCune-Reischauer form Samguk Yusa. There's Spring in my heart. / Don't need my raccoon / 'Cause everything's fine, / As long as you're mine / There's Spring in my heart …" Back then, it was understood that "raccoon" meant "coat." The grave of Sinologist and Manchu scholar Jerry Norman, with his Manchu name elbihe 'raccoon-dog'. Outdated. Red pandas aren't procyonids or mustelids – and neither are skunks. Start here. The most recent molecular-systematic DNA research places the red panda into its own independent family, Ailuridae. Ailuridae are, in turn, part of a trichotomy within the broad superfamily Musteloidea (Flynn et al., 2001) that also includes the Mephitidae + Mustelidae (skunks + weasels) and the Procyonidae (raccoons); but it is not a bear (Ursidae). The red panda is the only living member of the Ailuridae. Since it is part of the superfamily Musteloidea, that means it is still considered to be closely related to the Procyonidae (raccoons), which also belong to that superfamily, as do the mustelids. In the original post, I mentioned the exaggerated scrotum of the tanuki. Here is an amazing clip from "Ponpoko" that shows the raccoon dog warriors using their enormous testicular sacs for various creative purposes. I know this is an old thread, but I'm surprised that in all this discussion there's no mention of the tanuki suit in Mario games.